We offer an exclusive range of Industrial Trolley Cabinet to our esteemed clients. The offered products are fabricated using best quality raw material and superior grade components at our vendor end. The offered product competes with the various parameters on quality. We are highly acclaimed in this industry for providing an optimum quality range of Battery Cabinet Trolley. 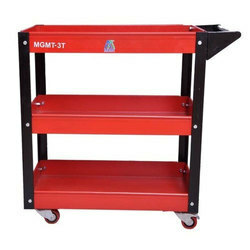 MGMT - 6DC Tool Trolley With 6 Drawer & Cabin. 1) Strong handle for easy action. 2) Central locking with cylindrical key. 3) 30 to 70 kgs. Load capacity per drawer depending on drawer size. 4) Even load distribution while opening and closing. - A Traditional style with full width top four drawers and spacious cabinet at bottom with Locks. - Solid & Rounded edge heavy duty structure . - Insert for each drawers for holding a particular tools. - Rubber sheet at top. - Paint / Powder Coated. 2) Five Heavy duty drawers of different sizes. 3) 40 to 70 kgs Load capacity perdrawer depending on drawer size. By keeping the track of the latest market trends, we are engaged in manufacturing and supplying an exclusive range of Vintage Trolley Cabinet. 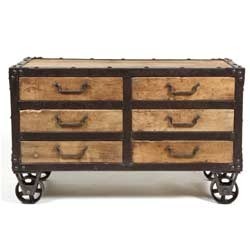 Attractive and Reliable Wide Range of Vintage Trolley Cabinet. · Approx. Size - 336 x 400 x 850 mm. · Made of ABS Material. · Single row, 20 layers with a drawer.